Lucky Hand or Salep root is a hand-shaped root that comes from several species of orchids. It is becoming very difficult to find and when you do, it is almost always sold in a paper envelope which hides the actual contents from view. This root among the most powerful ingredients that can be added to a mojo bag or gris gris designed to increase gambling luck or occupational success. Sometimes called "salep" or "saloop" root or "five-finger root". This root protects from evil, protects during travel, brings travel through employment, brings love, wins at gambling and lottery, brings better business, gets employment, and brings success to your endeavors. The ancient "doctrine of signatures" dictates that objects in nature reveal their magical or medicinal uses through their form and colour. Thus, the light to medium brown, multi-fingered Lucky Hand root is thought to have special provenance over "all the things that five fingers can do." For this reason a Lucky Hand root may be carried by those who play the lottery, bet on horses, play cards, or partake in any other form of gambling. 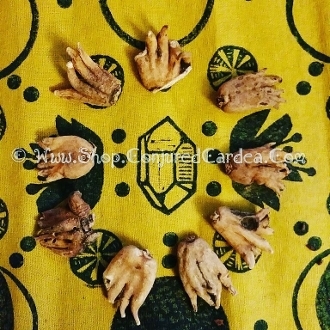 When combined with five-finger grass, a John the Conqueror root to increase personal power and mastery, and a lodestone dressed with magnetic sand to bring in the winnings, the Lucky Hand root simply cannot be beaten, according to its devotees. If you would like this mojo, please contact me! It will have a permanent home here soon at Conjured Cardea! For personal power place a Lucky Hand Root along with a John the Conqueror Root in your mojo/conjure bag. While reciting Psalm 23, hold the root while praying for what you need or wish to obtain. *The picture is an example. You will receive ONE ROOT. curio only. no claims are made as to the use/ability of this curio. © Conjured Cardea™ 2009. No part of the content, designs, photographs, product trade name(s), trade product design(s), intellectual property, and product(s) can be used without prior express written permission. All rights reserved.